We were in search of aliens. Destination Roswell, New Mexico, famous for its crashed UFO in 1947. These retailers sure know how to market an alleged event. There’s the UFO Storage, Alien Zone, Not of This World Restaurant and The Cover-Up Café with a menu of Debris Fields (waffles with pecans), Crashed Flying Saucer (scrambled eggs) and Flat Weather Balloons (buttermilk pancakes). Onward, to the ET Highway and the Little A’LE’INN Café in Rachel, NV. 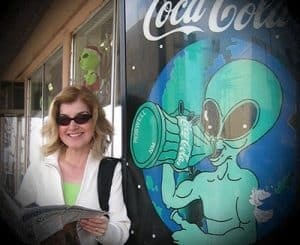 This tiny town has a cult-like notoriety for its proximity to Area 51 where that alleged Roswell UFO and its contents were allegedly relocated by the US military. Now that the files have been officially declassified, I hope Rachel retains its appeal to alien searchers like us. The “Spruce Goose,” constructed almost entirely of birch, is located at the Evergreen Aviation & Space Museum in McMinnville, Oregon. Six times larger than any aircraft of its time, the Spruce Goose, or Flying Boat, made only one flight on November 2, 1947. (Too late to help the war effort!) Piloted by Hughes, it flew over one mile at an altitude of 70 feet for one minute. After Hughes death in 1976, the plane was moved to a hangar in Long Beach, California, until the Evergreen Aviation & Space Museum won the bid to provide this aviation icon with a proper home. Never argue with Elvis . . . unless you’re paying him to take a picture and want him to stand between you and your cowboy under the iconic Welcome to Fab Las Vegas sign on Las Vegas Boulevard. And while you ain’t nothin’ but a hound dog, Elvis, we’re wearing our western duds for the annual National Finals Rodeo in Sin City. Giddy up. I’m at the Las Vegas Speedway and hanging from the “Black Diamond,” our one-ton Dodge dually. The LV Speedway is known not only for NASCAR racing but for the famous Shelby shop. We saw rows of parked Mustangs waiting to be ‘super snaked’ by the experts. At the Neon Boneyard, home to a collection of historic Las Vegas signs, we grew nostalgic for the vintage days of Sin City, for the glamor and glitz; for the days when a tourist arrived with $100 and left with $1000; for the days when mob bosses ran the city, not corporate America, when a person didn’t drop a gum wrapper out of respect and perhaps a little fear. The rusting signs of the Neon Boneyard reminded us of a different face this desert city once revealed, a face with rich history. We stopped at a highway fruit stand. I’ve never before or since tasted sweeter and more delicious fruit than in Wenatchee, WA – temperature 102 degrees. I hurried back to the truck, my paper bags brimming with apricots and cherries. The next morning I refused to abandon the remaining fruit, so finished off everything while waiting in line at the border crossing. When I handed the Customs agent my passport, I also surrendered a crumpled bag of apricot and cherry pits! The destinations for travelers – Athens and Olympia, Rhodes and Mykonos – were picturesque. Yet it was the minor moments that pushed deep roots into my psyche, such as cats that coiled around my legs and bounced onto my lap. These strays recognized the hopeful rustle of a bag, one that promised leftovers. I gathered chunks of meat and cheese after each meal, enough to fill a few flea-scratched bellies. Each purr and head nudge lingers in my memory, longer than any piece of antiquity I studied through nose-smudged glass at the National Archeological Museum. After lunch at the Russian Tea Room, I walked through the Taft Hotel where they filmed several scenes from The Graduate. (It’s now the Michelangelo Hotel). From there, I visited the The Original Soupman aka Soup Nazi from Seinfeld. The server was stone-faced, as hoped. Finally, I wanted to find Rupert Jee at Hello Deli. Both Rupert and his deli were regularly featured on the Late Show with David Letterman, which had ended the previous week. Before entering, a friendly construction worker insisted I take a picture with him. New York City welcomed, entertained and fed me well! The buildings of Tallinn, Estonia, have steep red-tiled roofs and impressive church spires. The Tallinn Town Hall – the tall spired building to the left – is the oldest town hall in the Baltic region and Scandinavia, reportedly built in the 1300s. Leaving Tallin, I had fun drinking beer on the ferry to Helsinki, Finland. I’d lost my voice somewhere along my travels and had to communicate with facial expressions and hand gestures. Despite my drawback, a Finnish man shared the duration of our ferry sailing. He spent a lot of time talking about his ex-wife, so perhaps my inability to speak became my best feature! In the food store, I wanted a few chocolate bars illustrated with a babushka-wrapped baby. I handed the cashier my bill but she pushed it back with an unsmiling “nyet!” She wouldn’t accept the denomination of ruble. Since I say “da” to chocolate, I returned with a handful of coins. After six nyets in one day, I felt I was livin’ it, Russian-style! “You made a long journey from Milan to Minsk, Rochelle, Rochelle,” sang Bette Midler in an episode of Seinfeld. Like Rochelle, I also made it to Minsk. 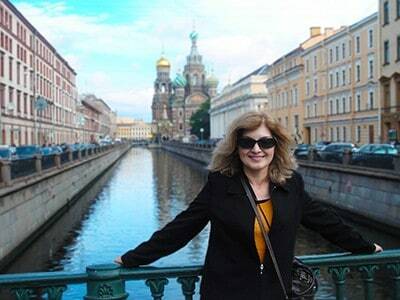 While I treasured a tour through Victory Square and a night sky of fireworks over the city, I especially loved the lively hotel bar and dance floor. When I ordered vodka, the server returned holding a saucer. My chilled shot glass was circled by a green olive, black olive, cocktail onion and red grape. Between loud music and a language barrier, we let her pluck an array of Belarusian rubles from our hands. Might have been the most expensive round ever!